Lossless data compression is a class of data compression algorithms that allows the exact original data to be reconstructed from the compressed data. 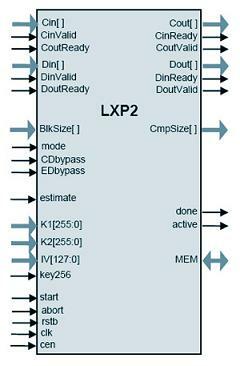 LXP2 implements the lossless compression /decompression algorithm and AES-XTS encryption /decryption on units of data (“blocks”). Typical applications include enterprise data storage. LXP2 delivers 1-3 Gbps of throughput in both FPGA and ASIC implementations. The compression ratio greatly depends on the data and somewhat depends on the frames size; on typical file corpuses varies between 1.5 and 2. K1[255:0] Input 128/256-bit AES key. 128-bit key resides in the MSB of this port. K2[255:0] Input 128/256-bit tweak key (K2). 128-bit key resides in the MSB of this port. key256 Input When HIGH, the K1 and K2 are 256-bit wide. When low, the keys are 128-bit wide. The core implements lossless compression / decompression and encryption / decryption of data blocks from 512 bytes up to 16 megabytes in length. The cores are subject to the US export regulations. See the IP Cores, Inc. licensing basics page, http://ipcores.com/exportinformation.htm, for links to US government sites and licensing details.